As Danbury builds more models, their collective talents are honed ever sharper. I have started to notice some improvements over their other releases and that includes replicas based from prior toolings too. Case in point, this gorgeous 1970 Corvette T-Top coupe. Their diligent research obviously revealed to them that the body was changed, ever so slightly, from the 1968 Corvette roadster that this coupe is related to. So too was the vacuum canister, rally wheel centers, master cylinder cap, air conditioning compressor, seats and belts. More on these in a moment. The diecast shares many innovative features with the convertible but a lot of newer nuances also went into its build. The doors are still our favorites, perched on hidden hinges. The visors and headlamps raise and lower. The latter has a unique button, operated by a pencil or pen tip. It is located in an air duct under the front driver’s side grill intake. The spare tire box lowers and allows the tire to be removed. The suspension works, the seats fold forward, the hood is held up by a realistic prop rod and the fuel filler door opens. So what are the improvements that I have noticed? Some are subtle, some are in-your-face, but all are very welcome enhancements to the diecast craft. Badgings are no longer tampo printed. Metal emblems adorn the nosepiece and the filler door. Metal-foil script highlights the rear valance spelling out, “Corvette” in block letters, and “Stingray” in script on either side of the front fenders. Speaking of fenders, the body of the 1970 model received flared out fender extensions to help prevent stone chips along the body sides. DM fashioned this change. The side gills of the ’68 and ’69 model years were upgraded to egg crate venting and this model sports them. The interior received a good dose of modification as well. There are new door pulls and the genuine seat leather is better defined. Behind the seats, the three hatches still open, although they have received the chrome ring pull-holes just like the upgrade on the real car. There is a center stowage compartment and on the outboard hatches we find the battery and the jack. But as you fold the seat forward you’ll notice the extra long safety belts. They may be pulled through the seat and manually withdrawn again. The brake and clutch pedals are changed, as is the steering wheel. The rally wheel center cap looks far more realistic since it received blackout treatment between the ribs. Greater depth was achieved this way. One of Danbury’s fortes in the diecast arena has always been the engine bay. There’s no exception on this ’70 LT-1. 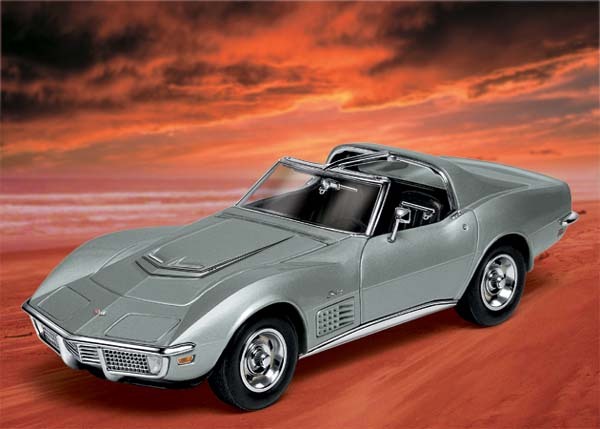 For 1970, Corvette produced 1287 LT-1’s. The 350 cube motor produced 370 horses. A total departure from the DM ’68 car, all new components were researched and used. The master cylinder’s dual reservoir cap has two well defined hold-downs in a contrasting color. The vacuum canister, used on the 1:1 to lift the windshield wiper door and the headlights, was all new for 1970 and DM captured it correctly. Plug wires are under the ignition shielding, a three-piece affair on the 1:1. A/C compressor changes and vacuum hose amendments have all been made in accurate order. The T-tops are firmly held in place by two tiny pins that do their job well. DM even took the extra time to add the correct chrome trim around the roof panels. Instead of whitewalls or redline tires, we have standard blackwalls and no outside exhaust pipes. Clean. No corners were cut in fabricating this extremely well made replica. Once again DM has done their homework and brilliantly planned out all the small changes that make this such an enjoyable little car to behold. I find no flaws. This rates 5 Cortez silver stars on the old index and a perfect 5 out of 5 on today’s drool meter index.